Why should you identify carry-on luggage? After all, you're carrying it with you. Airlines require that all luggage have proper identification. This is for carry-on bags as well as checked luggage. They may not always check on this, but they could. An easily identifiable tag of your own is the best for this. Even though you're going to be carrying it on, it's always best to have a way to identify your carry-ons to tell it apart from the luggage of other travelers. A name tag in a bright color or one laminated with a big picture of your pet or something like that will make it legal and identifiable at a glance to you. You can use one of those paper tags that they have at airline counters. Put one of those on anyway... it will add to the "uniqueness" of your bag. You don't always have that carry-on bag with you. Once you get to your destination, it may ride in the back of a shared minibus or in the storage compartment under an airporter bus. Chances are that it won't go missing, but if you have identify carry-on luggage, you will at least have a chance of getting it back if someone else grabs it by mistake. This also helps if you have to leave bags with the hotel because of check out or check in times. It's important to identify carry-on luggage if you're on a tour. Your bags will get stored with the carry-on luggage of all the rest of your tour companions. Think what might happen if that bag gets "misplaced" while someone else is transporting it for you. We once were on a trekking vacation in India. On the bus ride to our trekking destination, our bag was left on the side of the road. Long story there! Several hours after we arrived at our hotel, the Indian army returned our bag because it had proper identification on it, and our itinerary inside. Size and weight restrictions can be much stricter abroad than you're used to. 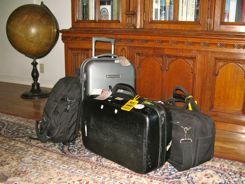 We've had to check suitcases in China and Europe that we routinely carry on at home. There is no use arguing that you always carry them on. Airline personnel have the final say, and if they say to check it... you check it. At least you have the proper identification on it. Security experts recommend that you cover your address so unscrupulous people won't know you are away from home. Some airline tags come folded so you have to open them to read them. We slip our identification into a plastic holder with the information hidden... you have to pull it out to read it. Some experts even sometimes recommend that you put a business address on the identification tag. That's fine, but you want an honest person to be able to contact you, so have a phone number or address or your itinerary where they can find you if necessary. Those name and address tags are the best way to avoid lost luggage whether you intend to carry it on or not. Because it just makes sense.